I saw The Food Network Magazine 1000 Easy Recipes cookbook showcased on QVC and I immediately requested it from my local library. When I picked up the book, the library staff mentioned how impressed they were when they browsed the recipes, so I was looking forward to diving in. When you initially flip through the book, you immediately notice the stunning photos; pages and pages of detailed, full-color photographs illustrate how the finished dish looks. The first part of the book highlights a few chosen recipes to consider for specific menus. Menus like Pizza Party, Thai Dinner Party, Tex-Mex Night, Autumn Dinner Party, Farmers Market Lunch, Vegetarian Night, Cozy Winter Supper and Family Picnic to name just a few. I was really looking forward to checking out some of these recipes: Ginger crackles, maple walnut trunks, bell pepper pasta salad, veggie burgers, popcorn, oat walnut thins, and peanut butter mousse. Yum. As the book sub-title “super fun food for every day” suggests, it’s all about putting together uncomplicated, quick family meals: Grill a burger, throw together some salad veggies and you’ve got dinner. Make no mistake, this is not your average instructional cookbook, I suppose you could say the “recipes” in the book aren’t even recipes – for each type of dish, there are dozens of variations, each with only a simple paragraph “description.” The concept is very similar to Mark Bittman’s “Kitchen Express” cookbook. While there are a thousand recipes in the book and a few tips scattered here and there, there are no instructions for basics like roasting a whole chicken or peeling a fresh artichoke. No one is holding your hand as you braise a beef chuck roast or make your first creme brulee. The Food Network Magazine 1000 Easy Recipes cookbook motivates a lot of experimentation in the kitchen, but does it go overboard with so many variations for one type of food? Sure, you will probably never need 7 pages of crostinis or 40+ kebab variations, but at the same time, it is inspiring and interesting to read their flavor combinations. Bottom line, I don’t recommend buying The Food Network Magazine 1000 Easy Recipes cookbook, unless of course you are a big collector and must have every cookbook ever published. If you are wise, you’d just grab a copy from the library to browse through first. Then find your favorite recipes online at the Food Network web site or just jot down a few notes from a few favorites as the recipes are so short and sweet. This cookbook seems more like of a novelty, which isn’t necessarily bad, it’s just that personally, I can’t envision myself referring back to it again and again as I would with a more “mainstream” cookbook. Yeah, these books get you thinking in the right direction (and they did help me initially), but truthfully, they are really just about eating better-quality junk food; at the end of the day, it’s still junk food. The original ETNT book was published in late 2007, and since then, the authors/publishers have cultivated this “brand” into a huge franchise, publishing new, updated versions every year, and coming up with more titles, such as “Drink This, Not That” and their “Restaurant Survival Guide.” According to wikipedia, as of Sept, 2011, they’ve sold more than 8 million books! I was curious about the “Cook This, Not That – 350 Calorie Meals” version, so I borrowed it from the library. Big problem though. I found some, if not most, of the book examples weren’t fair comparisons. For example, lasagna rolls (page 196) compares itself to Olive Garden’s Lasagna Rollata al Forno. The recipe calls for 6 oz of long thin lasagna noodles, to make a 6 serving recipe. That’s only 1 oz of pasta for each person, calculating a total of 380 calories for each serving. Come on! Do they really think we’re going to be satisfied with only one serving? Compared to the size of the Olive Garden plate, I would venture a guess that you’d need at least TWO (or more) servings, totaling 760+, coming a lot closer to the Olive Garden’s 1170 calorie plate. A second example, the California Pizza Kitchen Original BBQ Chicken Pizza (page 180) is calculated at 1136 calories for a whole pizza (web site states current calories are less at 1055). The recipe makes 2 pizzas divided into 4 servings, at 380 calories for half pizza. How is that fair? Eating the whole homemade pizza brings the calories up to 760. A little sneaky and misleading that they’re not comparing apples to apples and pizzas to pizzas! Most recipes were pushed down to the 350 calorie mark, but don’t be fooled, because in order to reduce calories, they weren’t giving you complete meals. Most so-called meals were only proteins. No carbs, no vegetables. For Example, 360 calories for Chicken Pizzaioli (page 222) is compared to 1090 calories for the Olive Garden’s Chicken Parmigiana. Well, they kind of left out the fact that their version gives you a much smaller portion of chicken and doesn’t include any pasta, so in reality, it’s really not such a mind-blowing difference, is it? Same with Herb Roasted Turkey Breast (page 228) compared to Bob Evans Turkey and Dressing. The recipe just calculates the turkey at 140 calories, but remove the dressing and gravy from the Bob Evans plate, and I bet it comes in just about equally. Very sneaky! 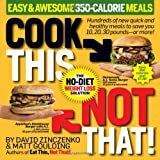 Don’t waste your time with “Cook This, Not That – 350 Calorie Meals“, you’ll only be disappointed; their low 350 calorie meals are unbalanced and incomplete. 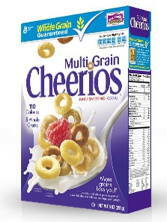 They will not fill you up, and you’ll be searching for something else to eat, adding more calories to your daily total. If you need help to cook healthy, satisfying meals at home, borrow a Jamie Oliver book from the library; I especially love to recommend Cook With Jamie. Also highly recommended is Hallmark TV channel’s “Mad Hungry” with Lucinda Scala Quinn. I love her down-to-earth, simple recipes! There are also countless amounts of instructional cooking videos on youtube, and even many cooking podcasts on iTunes. These are all much better choices than anything offered from the Eat This, Not That franchise. Good luck! 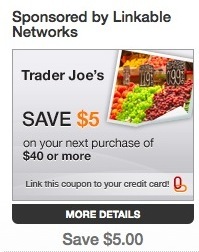 Discount of $5.00 off your next purchase of $40.00 or more for products at Trader Joe’s. Limit one offer per registered user. This offer is being sponsored and paid for by Linkable Networks, Inc. The offer is NOT sponsored, endorsed or affiliated with Trader Joe’s. This offer is only valid for qualifying purchases made on the Payment Card which is registered with the MyLinkables.com service and to which you linked the offer. Offer valid on purchases made from 12:00:01 A.M. Eastern Time (“ET”) on 02/17/2012 or the date in which you link this offer to your card (whichever is later) and ends at 11:59:00 P.M. ET on 03/16/2012 (“Offer Period”). This Offer is valid in the U.S. only. Gift certificates/cards, packaging, taxes and prior purchases do not qualify toward the minimum purchase requirement and the discount cannot be applied to such items. This offer cannot be combined with other offers, promotions or discounts. No adjustments on previous purchases. Purchases made with this offer are not eligible for a price adjustment. Offer is non-transferable and may be cancelled or modified at any time. The offer is void where prohibited. This offer is subject to the MyLinkables.com Terms of Service (https://www.mylinkables.com/termsofservice). This offer is being sponsored by Linkable Networks, Inc., 268 Summer Street, 5th Floor, Boston, MA 02210. Your savings will appear as a Payment Card or PayPal (if applicable) statement credit typically within 7 to 14 business days after the merchant processes your transaction. This discount is the responsibility of Linkable Networks, Inc., the offer sponsor. Your Payment Card issuer is not responsible for the discount’s funding. The premise of MyLinkables is, in a nutshell, you sign up, link to a credit (debit) card, choose a deal(s), make the necessary purchase using your linked credit/debit card, and soon you’ll receive the promised credit posted back to your linked credit card. I only recently joined MyLinkables, and I do not have specific experience with them just yet, so use at your own risk. I am planning a Trader Joe’s shopping trip next week, so it will be a good test. 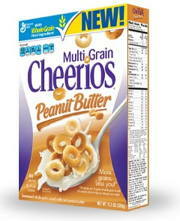 From what I have read online, they seem fairly reputable, but there are no guarantees. I must stress, before you join My Linkables, it’s important to understand that they require access to your online credit/debit card log-in credentials. You can initially sign up & log in without a credit card, and you can see the available deals, but in order to link to an deal, you’ll need to give them your credit/debit card username and password. I am extremely guarded about my personal privacy and security and I do not like external entities accessing my bank and/or credit card accounts. So, keeping security in mind, I thought it was wise to link to a rarely-used credit card account that was totally separate from my every-day accounts, and I also suggest that other users do the same. How Does MyLinkables Make Money? One more aspect of MyLinkables is their business plan. I wondered how they were making money if they were the ones sponsoring their own deals. I emailed them to ask, and to also inquire why a Paypal account was requested, since the refunds are supposedly credited to the linked credit card. MyLinkables has integrated with, or is in the process of integrating with several large banks and card networks. For these cards, the savings will be applied directly back to the card. For other cards outside of these integrations, the savings will be deposited into a PayPal account, for example. From PayPal, you have the option to transfer the money directly to a bank account. Since we’re a start-up, several of our initial offers were or are self-funded, as we build our customer base. However, recent offers available to some of our bank’s consumers have been sponsored by the merchants involved. Yeah, it all sounds wonderful, but truthfully, I am very hesitant because they do have access to your purchase history. And that could be worth a lot more than a $5 credit to them! So just be cautious everyone! MyLinkables is running a 2nd Trader Joe’s offer for $5 off $50, which expires on June 27th. Their first offer earlier this year worked out well. I made a $45 Trader Joe’s purchase on March 13 and the $5 credit was posted to my Paypal account on March 19. I would definitely use them again, but continue to use my separate credit card.